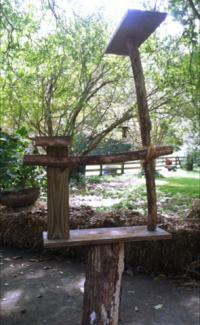 Although you can purchase cat trees, you can also make a rustic cat tree at home. No special skills are required for this easy and fun project and most of the materials are easy to find. The instructions for building the cat tree are fairly straight-forward. One handy tip is to gather all of your supplies before you begin so you don't have to pause in the middle of building the tree to go find something. It is also advisable to keep your cats away while you're building, both for that cat's safety and to make it easier for you to build. Select or cut a log to use. Make sure it is sturdy, not rotten, and fairly level on both ends. Place the 4-by-4-post on the ground. Put the 14-inch long piece of 2-by-8-inch lumber over top of the center of it. This will be one of the sitting platforms. Nail the board in place with 3 nails in a triangle pattern. Place the post on top of the plywood piece off to one side of the center. Nail the board in place with three nails, placed approximately one inch apart, in a triangle pattern from the bottom of the plywood piece. Nail the longer stick to the center of the 24- inch piece of lumber with two nails. Place the other side of the stick on the plywood platform, off to one side. Nail the stick to the platform with 2 nails from the underside. 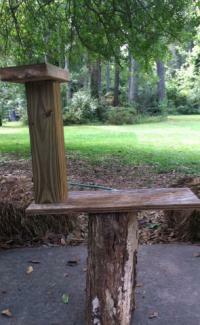 Place the shorter stick across the longer stick and wood post horizontally. Nail the stick in place with one nail on each end. This will serve as a support and handle to move the tree easily. Cut a long length of twine or rope and wrap it around the joining location of the two sticks. This will give the tree a more rustic look and give the cat's a fun place to scratch. If your completed tree seems shaky, you may want to add some supports to make it sturdier. Cut two 4-6-inch diameter sticks to measure the exact same length as the base log. Position them on the sides of the base log under the main platform. 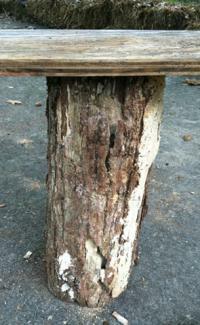 Nail them in place about six inches away from the main log in the center of the platform. Use one nail directly in the center of the sticks. 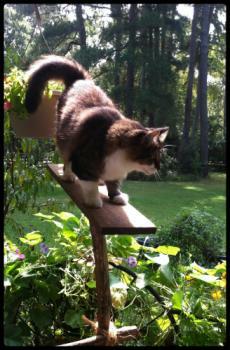 This will add support to the base of your cat tree. Need a printable copy to take with you as you make the tree? Click on the instructions below to print and download. Note that you must have Adobe Acrobat in order to view and print the instructions. If you need help downloading the instructions, check out these helpful tips. 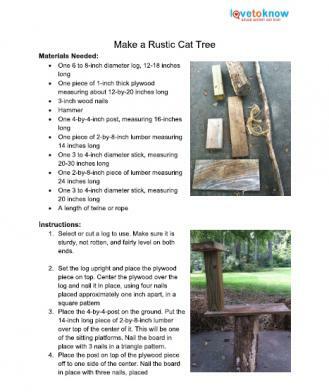 Click to print these rustic cat tree directions. Feeling a little creative? Try one of these easy variations to make your tree unique. No matter how old, cats love to play. If you have more than one cat, they will enjoy chasing each other, playing and napping on a realistic-looking cat tree. If you don't happen to have cats, ferrets will also enjoy this structure.